This Newport 300 Rod Platform is a precision-machined aluminum mount which fits the 1.500 inch diameter Model 40, 41, & 45 Rods. 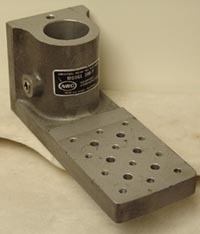 With 3 mounting surfaces, drilled and tapped to accept 1/4"-20 fasteners and in a clear anodized finish-this platform is double bored to form a two-line contact surface to assure wobble-free clamping to the rod. These are the original one-piece cast construction, which I think offers a more solid mounting than the later 2-piece constuction.